You might want to know that our Swing Sets can also be designed completely from scratch! It all stems from the modular nature of our product—the idea that our various component parts can be put together and arranged in hundreds of ways. It's a concept we like to call "Countless Configurations". If that level of customization interests you, then get ready to order à la carte! You'll be able to choose from our three styles of Gyms, Swing Modules as well as numerous Play and Swinging Accessories in order to create the Swing Set of your dreams. The configurations are countless, so let's get started! As explained on pages 6-7, the "Gym" is the central component of every Creative Playthings Swing Set. 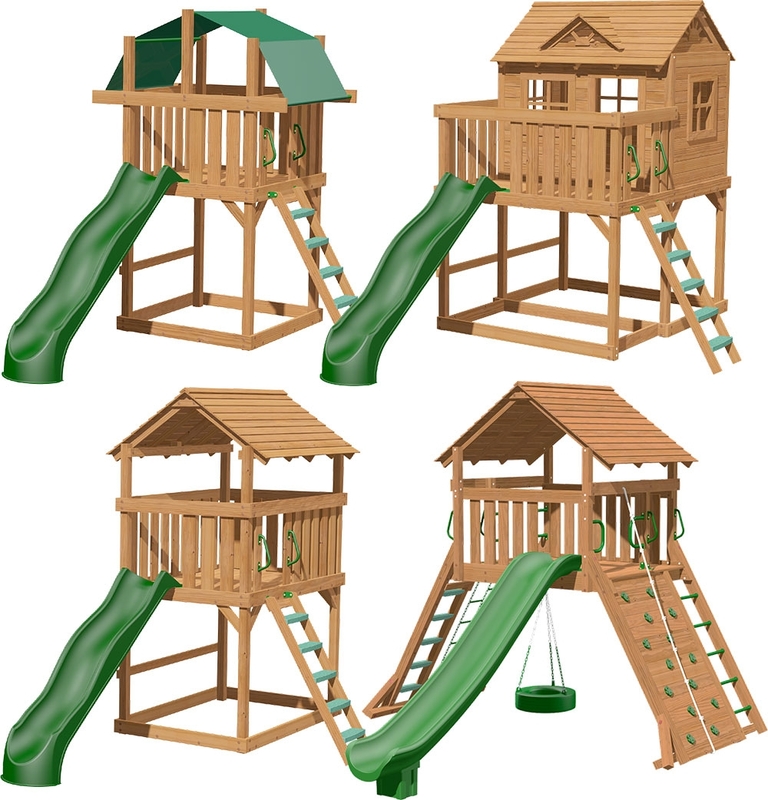 This two story play structure comes complete with an Access Ladder and Slide. It is where all accessories like Rock Climbing Walls, additional Play Decks and Swing Modules will attach. Note for customers with smaller spaces: If you aren't interested in adding swings, every Gym can be purchased as a stand alone play structure as described on pages 36-39. Twice the fun for three times the kids! If you are looking for an even bigger Swing Set, you may be interested in one of our massive Combo Sets! Every "Combo Set" is comprised of two separate Gyms connected using a Crawl Tube or Connecting Bridge. The results are endlessly diverse and more than often, breath taking! Do you want a Clubhouse or a Picnic Table? How about a Rock Climbing Wall or an extra slide? Two extra slides? Three? These are the choices that are almost as fun to make as the set will be to play on! Showcased in the pages that follow (42-49) you will find all of our Playing, Swinging and Wooden Accessories as well as things like Slide Handles and other grips. In some cases, certain accessories can be added to our various Premium Packs, Space Savers and Play Centers (pages 8-39). To find out if an accessory can be added to a certain predesigned Swing Set, please check with your local Creative Playthings store.